5 Top Panel Controls: Select Mode of operation, plus Gain control, Color control, Tone control, and output Level. 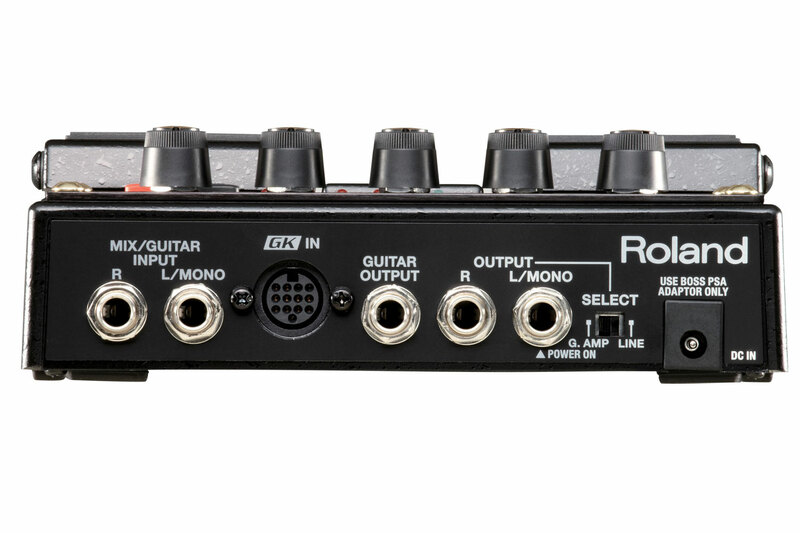 4 User Programmable Memory Locations: Save up to four user presets, and recall presets using either GK S1/S2 switches on the guitar, or the top panel "SELECT" button. Standard Guitar Input: Works as conventional programmable distortion pedal with 1/4" guitar input. Ambience Effect: Each mode also features an ambient effect to add a stereo space to the output. Ambient effect can be globally disabled as well. Weight: 1.1 kg 2 lbs. 7 oz. 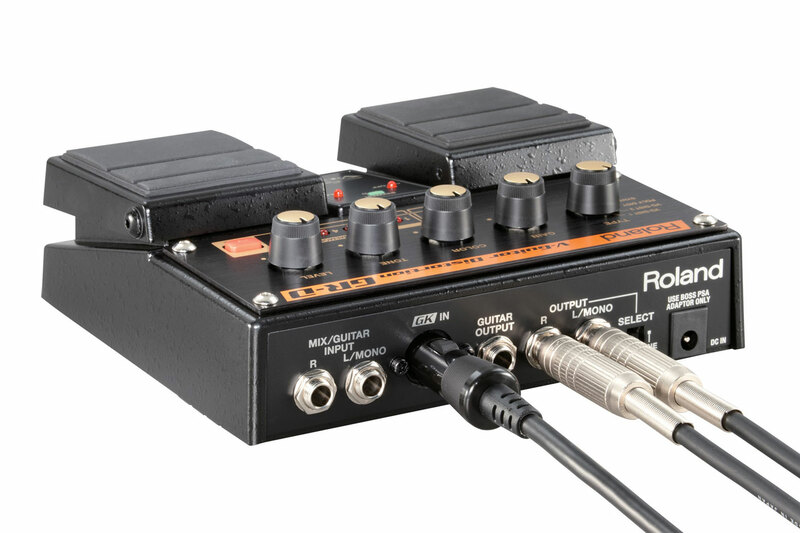 The GR-D and GR-S stomp boxes are the latest products from Roland Corporation designed to offer new sonic possibilities to guitarists, and to expand the user base of 13-pin Roland guitar synth players. These new pedals are similar to Boss OC-20G Poly Octave Pedal, and Boss WP-20G Wave Processor Pedal, which were released in 2001. 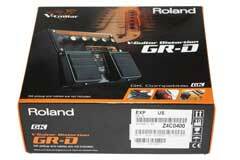 While the earlier Boss 13-pin pedals met with limited interest, Roland may do much better with the GR-D and GR-S pedals. The GR-D is presented as a distortion pedal, and the plethora of distortion pedals on the market shows that guitar players have an appetite for wide variety of overdriven sounds, and the GR-D delivers on its promise of unique distortion tones, not found in other guitar pedals. 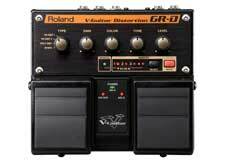 Furthermore, much to my great surprise and delight, the GR-D also works really well with non GK equipped guitars. 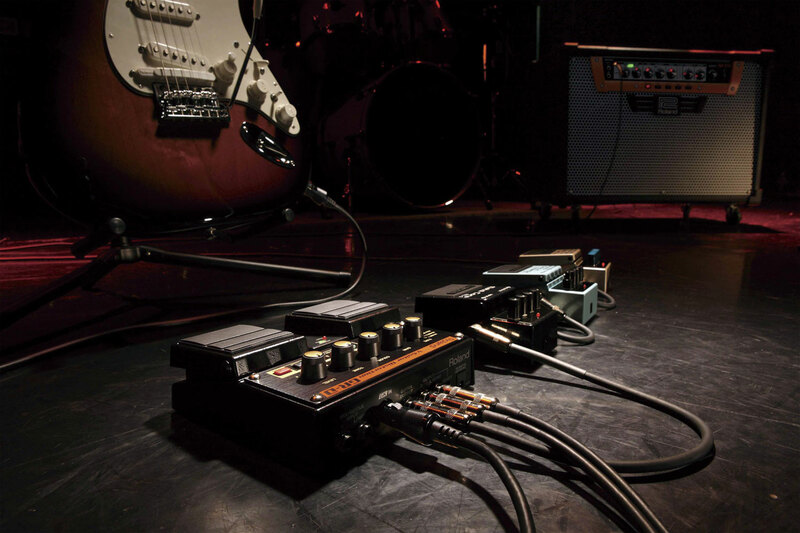 The pedals are clearly optimized for 13-pin guitars, the ability to use this as a standard stomp box expands it usefulness on stage and in the studio. 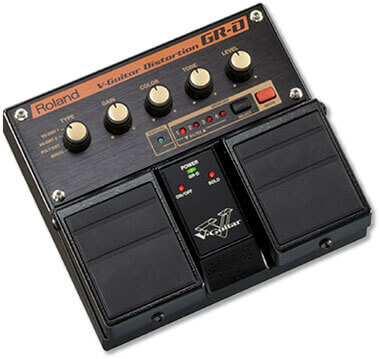 Side-by-side with a Roland VG-99, which contains much of the same technology found in the GR-D or GR-S, the newer GR pedals seem to have more impact. Curiously, this might be because of the limitations of the new pedals. Many of the factory VG-99 patches are laden with effects, which while adding ear candy, take away from the immediacy of some of the VG-99 patches. The GR-D and GR-S, with only a simple ambience added for stereo imaging, sound much more in-your-face. Roland makes a point of noting that by using the divided hex pickup, the GR-D promises increased clarity while maintaining high levels of distortion, since each string is processed individually. What is more impressive is how much gain and distortion can be added to the guitar sound, without the inevitable hum added by the most robust standard humbucker pickup in a high gain situation. Sensing the output of each string in isolation, the tiny humbuckers in the divided pickup do a much better job of common mode noise rejection than a large humbucker. There is a dramatic difference in the noise and hum levels with the GK-3. I tested the GR-D using three guitars: a Roland GK-3 equipped Fernandes Dragonfly Elite, a Godin LGX-SA with the RMC piezo system, and a vintage Roland G-303, with a BX-13-VC used to convert the 24-pin signals from the guitar to the modern 13-pin format. Also, a GK Basic Breakout Box was used so the individual signals from the GK pickup could be recorded and played back from my computer. This enabled me to manipulate the controls on the GR pedals while you hear the exact same phrase played multiple times, for a better comparison. 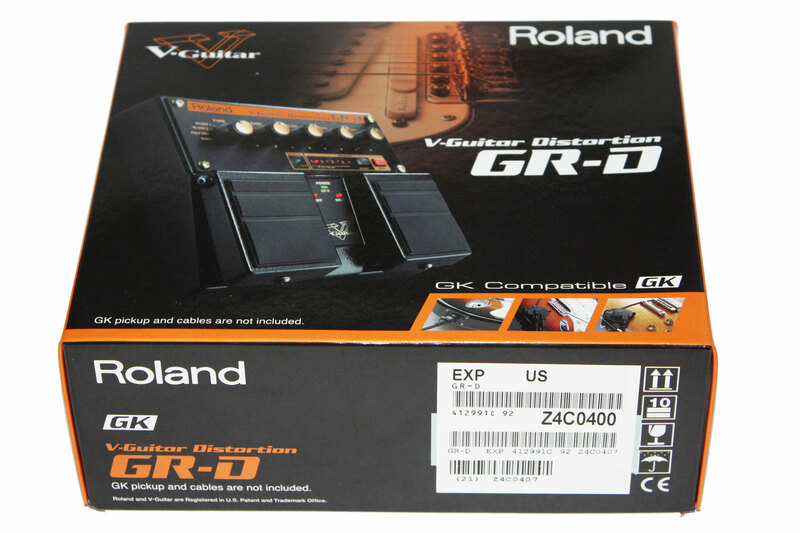 The GR-D has four modes of operation, VG-Distortion 1, VG-Distortion 2, Poly Distortion, and Synth. 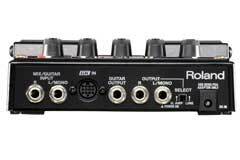 There are four control knobs to tailor the sound of the GR-D, and four user memory locations to store presets. There is also manual operation, where the sound of the pedal is determined by the current settings of the top panel controls. Note: there is no way to back up the user memories in the GR-D or GR-S pedals. The first three modes are different kinds of distortion, while the last mode is an analog synthesizer emulation. In the first three modes, the Gain knob controls the amount of distortion while Tone controls the brightness. Level controls the output. The function of the Color knob changes with each mode. For example, in mode one, VG-Distortion 1, the Color knobs controls the strength of the attack, increasing the amount of compression. 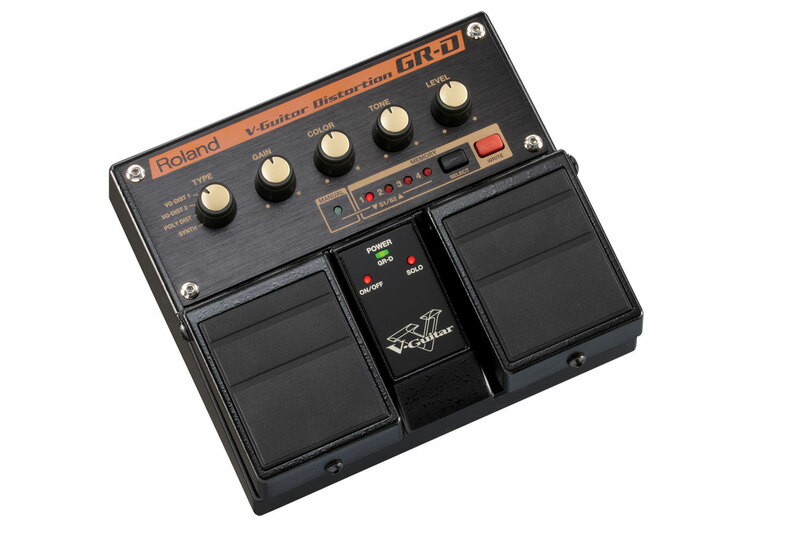 In all modes, the GR-D is very responsive to changing the GK Volume control on the guitar. And setting the Gain control to maximum results in some super saturated sounds with lots of sustain. 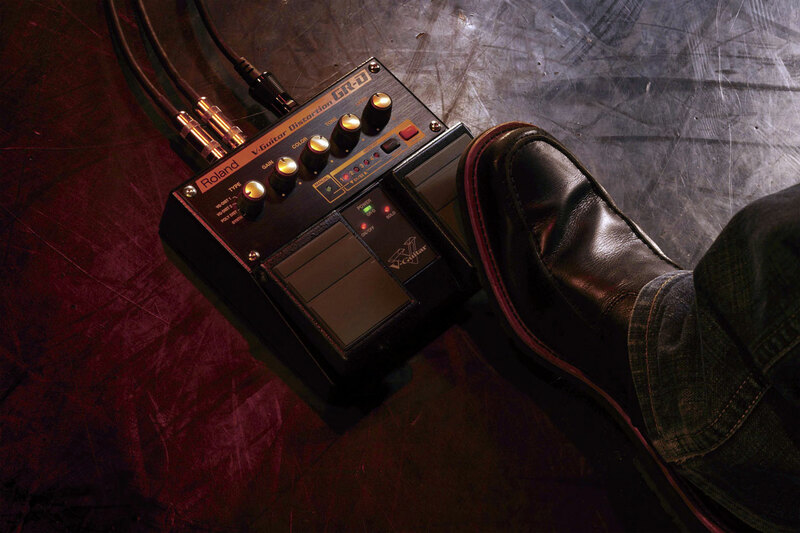 The left foot pedal turns the effect on and off, and the right foot pedal is a solo mode, with more gain and a midrange frequency boost to help your solo cut through the mix. In mode 2, a Wave Synth sound pitched one octave below the guitar is layered with the distortion sound. In this case, the gain knobs controls both the character of the wave synth, and the amount of gain in the distortion circuit. The Color controls adjusts the amount of the wave synth. The sound of mode 3, poly distortion, is classic Roland hexaphonic distortion, close in sound to the vintage Roland GR-100, which was a dedicated hex fuzz pedal made in the early 1980s. The sound of mode 3 is characterized by a thicker, saturated fuzz, with less dynamic range. Because of the lack of dynamics, poly distortion is not as effective for solos, but it works very well for chords. 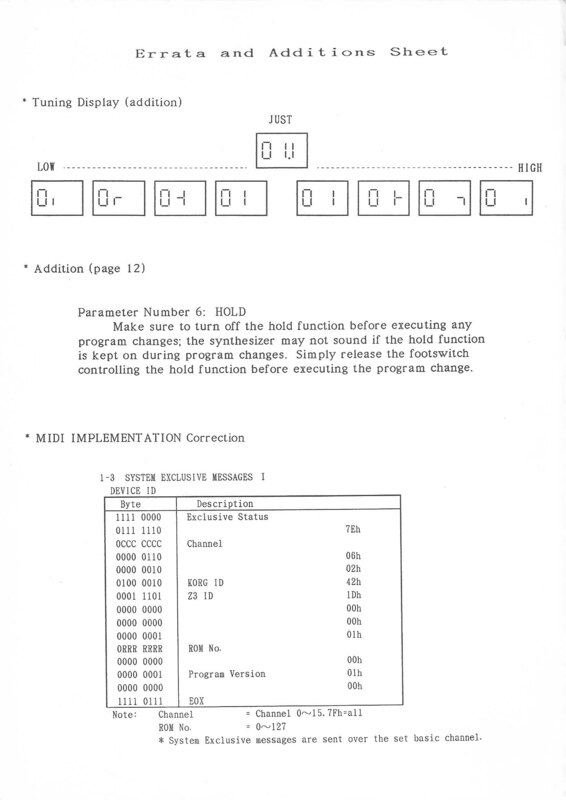 The manual notes that in mode 3, the Control adjusts the amount of separation for chords, and to my ears it sounds like a slight reduction of an over all distortion. The vintage Roland GR-100 included a chorus effect, and adding some chorus and volume pedal swells to the GR-D poly distortion really helps to recreate the symphonic sound hex fuzz is known for. Mode 4 is a straight-ahead guitar synthesizer section, which seems to be based on the Wave Synth algorithm found in the VG guitar synthesizer, and even in the aforementioned Boss WP-20G Wave Processor Pedal. The gain control blends from an octave below square wave output, to a sawtooth output, and color controls the amount of resonance, while tone controls the filter cutoff frequency. This type of synthesis is much more similar to the analog Roland GR-300, rather than Pitch-to-MIDI conversion, meaning there is very low latency, and the tracking is almost perfect. The GR-D and GR-S improved on the older Boss 13-pin pedals by including user memory locations. Also added on the GR-D and GR-S is the ability to fine-tune the response for each string. Hold down the “select” button while plugging a cable into the left/mono output. Pressing the on/off pedal steps through the six strings, and the tone knob is used to select eight different levels of string sensitivity. Press the “write” button to store the string sensitivity settings. If you change guitars, you may need to readjust the string sensitivity settings. The GR-D and GR-S also have an ambient effect to create a stereo image from the mono output of the pedals. By default, this feature is always on. You can disable this effect by holding down the right pedal, and plugging a cable into the left/mono output. Press “select” to turn the effect on or off, then press the “write” button to store the effect setting. The GR-D and GR-S, like most guitar pedals, do not have an on/off switch. Instead, power is applied with a standard 1/4” cable is plugged into the left, mono output. This is the opposite of a typical guitar pedal, where power is applied when plugging into the input jack. This is my biggest complaint with the GR-D and GR-S, as I had to be sure to turn my monitor mix down to avoid loud thumps when changing guitars or powering the unit on or off. This is not a factor on standard pedals which use the input jack to power the unit on or off. For a pedal using considerable DSP processing power, the GR-D and GR-S can run through batteries quickly, so plan on buying a Boss PSA AC adapter. The estimated lifetime time of the six included AA alkaline batteries is around 7 hours, and standard carbon batteries are estimated to last for just two hours. One final note, to avoid abrupt changes in sound when editing the presets, you must first turn an editing knob past the stored value. Once you do this, the manual LED starts to flash, indicating the patch is now different from the stored value. 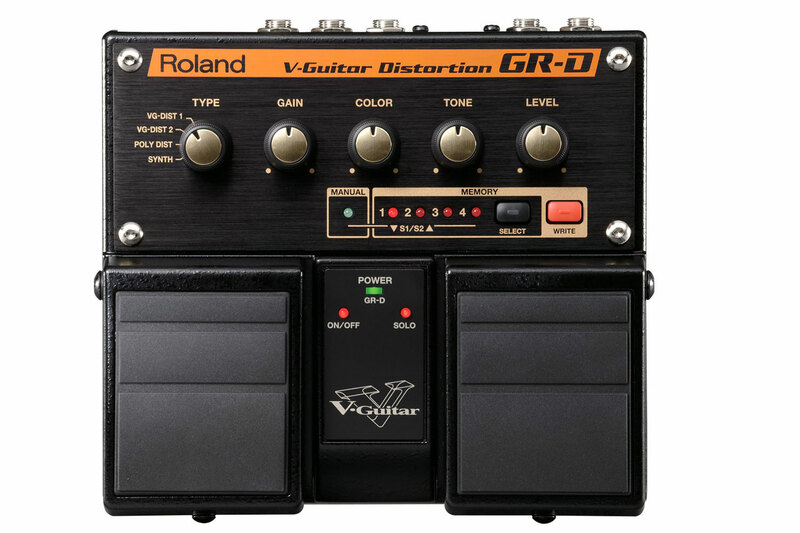 The kinds of distortion offered by the GR-D is not available on any other pedal. The GR-D can create levels of high saturation with both clarity and low levels of noise and hum, features only possible with a divided hex pickup. 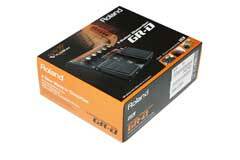 Roland faces quite a challenge with the GR-D and GR-S pedals. The necessary DSP power and related hardware is not cheap, so the GR-D and GR-S are more expensive than a lot of popular pedals on the market. On the other hand, the GR-D offers instant, huge, distorted guitar tones. It is true that much of what is found in the GR-D has been available for more almost 20 years, the original Roland VG-8, released in 1995, featured hex fuzz and wave synth guitar. But none of the Roland guitar synths shipped with presets as massive as those found on the GR-D. There is a lot to be said for a pedal that offers great tones right out of the box, without endless hours of tweaking and programming. And Roland deserves continued gratitude from forward-thinking guitar synth players as the only manufacturer to maintain a decades long commitment to innovating the modern guitar. 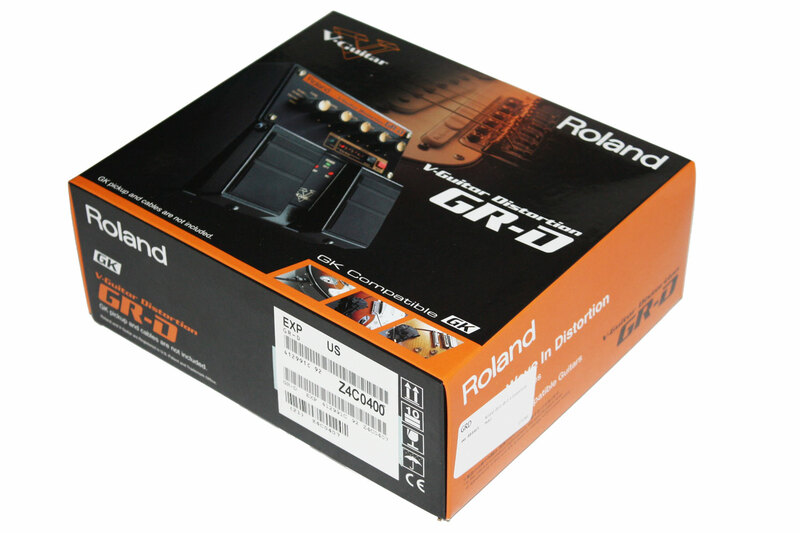 Including the GR-D, GR-S, GR-55, and the VG-99, Roland currently has no less than four different guitar synths to meet the needs of the 21st century guitar player. 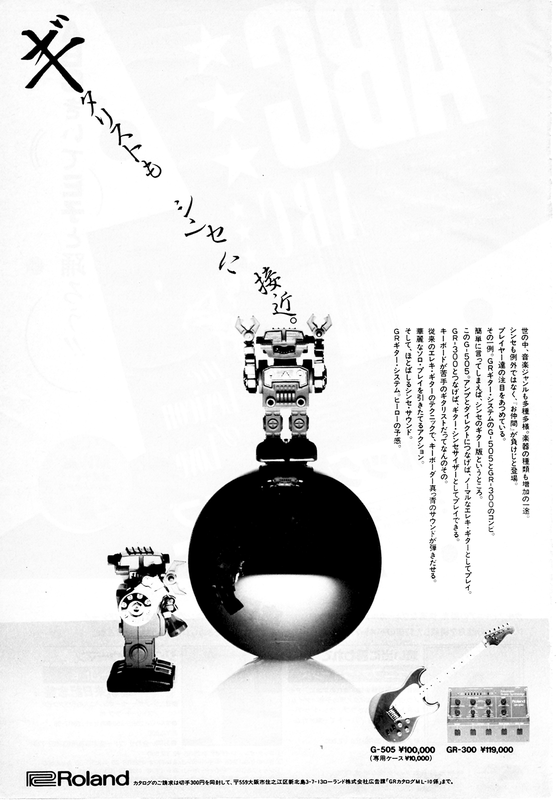 Download the GR-D Owner's Manual (pdf). GK Processing V-Guitar Global Official Page.